What is your personal and family policy re: marking in books? Do you mark books as/when you read, or do you consider that sacrilege? I'm not talking about library books, I'm talking about books that you own. Not only do I write in books, but I sometimes tear them apart into chapters. My law books were often over $200.00, but the classes were a lot more than the books. And books are cheaper than a prescription and doctor visit for pain from carrying around entire books, when the chapter is all I need at the moment. Textmapping is meant to be done on COPIES of books, but I often to similar things to a book itself. Books are TOOLS. I use my tools. When the pressure mounts, I use my tools harder, even if it means replacing them, afterwards. It depends on the book. Usually no, but I'm not religious about it. I am a fan of postits. I want us all to keep commonplace books. Paperbacks we mark up, hardcover generally no. If it's a book to be shared by many people, then probably no even for paperbacks. I mostly just get paperbacks now, and I mark them up all over the place when I read them! Hardcover books are actually easier to rip apart than paperbacks. They have less glue. LOL. Yes, mark up is part of engaging with text. Annotate away. None of us do so with fiction, we like our pages clean and unfolded, but nonfiction is penciled all over. No, nope, no way, never, NO. This has been my stance since I was a child. When I was in high school I tried writing in my copy of Hamlet because everybody was like "writing in books for English class is good because you can take notes in the book." It felt wrong, and it was not helpful or useful to me to mark up the book. I still shudder at the thought of it. Never again. I was always irked by people who said you could tell the state of someone's spiritual life by looking at how marked-up and worn out their Bible was. Uh, no. I treat my Bible with respect, and its decent condition does not indicate a lack of use. Notes go elsewhere, not in the text itself. I have matured enough to recognize that it is helpful for some people, so I try not to judge. 😉 But the thought of writing in a book is just...no. Pretty much never and not at all. If I need to take notes, I do it in a separate notebook. I occasionally highlight text in digital books, but that is only because I can turn highlights off. 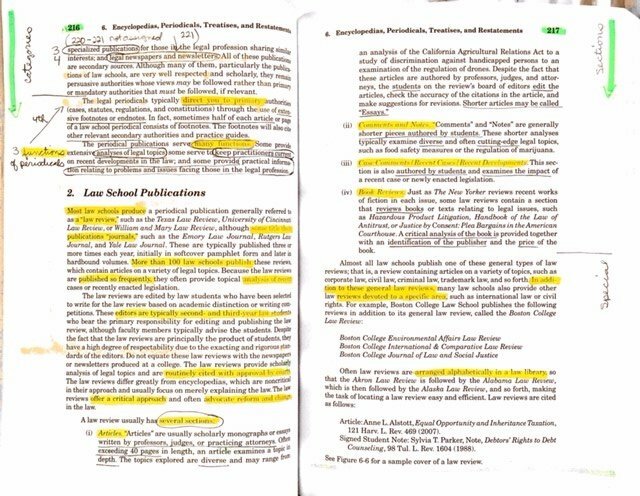 If I am looking at highlighted and/or annotated text, like Hunter's examples above, my eyes and mind only see the yellow boxes, underlines, ovals, etc. Pretend that the text itself is gone, and all you see are the highlights, arrows, and boxes on a blank piece of paper. It takes a lot of processing for me to distinguish the text that is layered underneath to the point of getting a migraine. This is also why I really dislike textbooks that have colored boxes, decorative elements (squiggle lines, etc), quotes in the margins, etc. It is frustrating for me to read such text because my mind and eyes want to jump there instead of following the explanations in the main body. 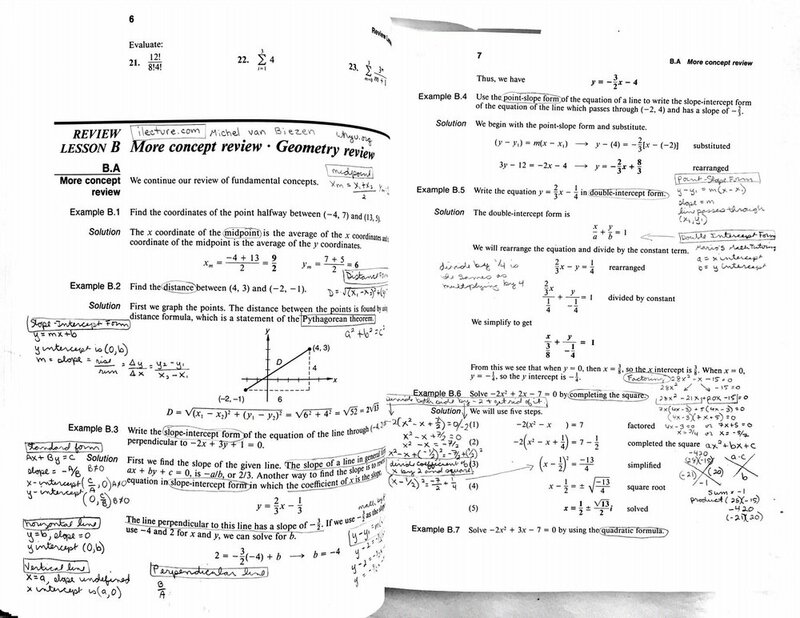 I recently had a stats textbook like this, and it was a huge struggle to read it. Just give me black text on white paper without huge margins, and I'll be happy. When a book is a gift, the giver can and should write a note in the front with the date. But otherwise, No No No. I've even done the thing that Hunter mentioned of just carrying around the current chapter of the textbook. But except for the time a textbook got wet and disintegrated (which gave me the idea). I would photocopy the book and just carried the photocopied chapter. Thinking back, even then I didn't write in the photocopies. I might have folded up some sheets and put them in a pocket. But I don't even see a use for writing in them. I write someplace else. When I reread text, I'll be more knowledgeable next time and I don't want to be distracted by previous, probably silly scribbles. And I even more don't want to read someone else's scribbles. I rarely mark up fiction, but I also rarely buy fiction unless it is for my kids. Usually if there is a passage I like I write it down elsewhere. Now my Bible is another story. I highlight, underline, write thoughts, write what someone said about the passage, write other ways a particular word has been translated, etc. I typically date whatever I mark so it can be interesting coming across a passage again and realizing what was going on in my life at that time. I also have letters and handwritten notes in my bible. When I read non-fiction I sometimes mark up the book and other times don’t. It all depends on how much I am learning and want to remember from the book. It also depends on if I might pass the book on, if so I probably won’t mark it. As for my kids I wouldn’t mind if they were thoughtful with their marking and the book belonged to them. I did notice my 11 year old underlining passages in his bible this past Sunday, to me it symbolized growth in his spiritual walk. My 6 year old writing in a picture book would be viewed as graffiti though. I annotate in books when I’m learning from them. It helps me engage. I can’t convince my kid that this is an ok thing to do, so I arm her with post-it notes and flags. How to Mark a Book IOW, yes. We do have leather bound, beautiful copies that we don't write in. But, otherwise, write away! Love the book and have a conversation with it! Yes! Absolutely!! Annotation is necessary!! As other have said, not in nice hardbacks. Not in most homeschool books, no. I try to resell them. Nonfiction that I own - I underline and highlight. Very rarely write other notes. Fiction - for purposes of analyzing the writing, to improve my own, occasionally. My Bible - lots of highlights, underlining, notes, etc. But I also have a couple (dozen) of clean copies to read when I want not to be distracted. okay, not really a couple dozen. But translations interest me, and I do have probably a dozen Bibles. I only write in my main Bible, though. One of my law classes allowed open book tests. No notes, just the textbook. We had a short timed test EVERY class on the assigned reading, which hopped all over the several chapters and was often odd questions asking for a precise answer to something that was only vaguely discussed in the book. I had the textbook color coded by test, and all marking were geared towards helping me to quickly lift the information from the text that I expected to be in the text questions. Those notes are distracting when later reading the text with a different purpose. Notes can freeze the text to an individual and the moment of time it was being read by that individual. Some humans are comfortable taking up more space than others, and some of us can be more or less comfortable with how much space we take up at different times of our lives. Some of us are more comfortable marking one type of text, but not another. WHY we do or do not mark a text is interesting. Sometimes our choice is reflective of the culture we come from, or the events taking place at the time we read the book, rather than reflective of ourselves. Textbooks? Yes. My Bible? Yes (because it's kind of a textbook). Other works? No. No. I can't even see annotating. Even if each kid only wrote in 15 books each year of high school, that would be 15x4x5 single use books. I never write in books - I don't like the way it makes them not 'new' to the next reader. I either take notes in a notebook or write on index cards and scatter them through the book as bookmarks - I have them as references, but if I pass the book on to somebody else, they can take them out. I hate reading books that other people have written in. I do write on things that I print out - science journal articles, mostly. Strangely, I do it even knowing that my comprehension and memory tends to be better if I actually take notes instead of scratching in the margins. The exception is labeling figures - when I print an article, it's usually helpful to annotate the figures so that i know what the important parts are. More people should write in their books. I've been trying to train my kids to do it and they keep resisting me. I tell my DD to mark them up. I read an essay by Mortimer Adler where he essentially said that you don’t really internalize a book unless you own it, and marking it is a way of owning and interacting with it. I’m taking about literature or history. Of course, I buy a lot of used paperbacks for this purpose. Ironically, though I give the kid license to mark her books, I’m usually the only one who does it. Many times, I “write” in the book on post-its, so it doesn’t mar things too much for the kids when they get to the book. With math stuff that I might donate or sell, I make them write lightly in pencil. For myself, I’m with Hunter - sometimes I chop off the bindings of books so I can carry around a chapter at a time. I’ve done this not with literature or history, but with guide-type books - like BFSU, or the SOTW activity guide. Writing in books is one thing. Highlighting is something else. So often I get a book where the first few chapters are obsessively highlighted in some obscure code known only to the previous owner - yellow here, green there, pink and blue somewhere else, leave no word uncovered! - and then around chapter three or four they give up abruptly. Also: Insightful marginalia only, please. When you have to look up every other word, put it in a separate notebook. The next person to own your book is going to have to try very hard not to judge. I once heard Leigh Bortins of Classical Conversations say that we should let our kids write in their books. My 8th grader's school stresses book annotation over outlining. I grew up outlining so annotating is strange to me. But, now that he has been doing it since the 3rd, he seems to have perfected a system. I will admit annotating is far faster than outlining. No, I never write in books. I guess I highlighted in some college texts or test study guides. When I was in school, we usually weren't allowed to write in books because we had to turn them back in. I guess I never developed it as a habit since it was usually forbidden. I am going to take a look at the above links. It's an idea that intrigues me. I do occasionally use post-it notes to mark pages and passages. If I write in a book to that extent it has no next person. I put it in recycle when I get rid of it. You're a novelty. Lots of people think it's okay to pass those along. But people take it too far. I write in my cook books, but not in reading books. The cook books get all splattered anyway. For me, underlining or highlighting makes it hard to see something new on the next reading because my eyes hone in on the marked phrases. I love getting used books where people have annotated, too. Especially old cookbooks. A couple of notes, sure. Not in homeschooling books, not in library books, not in textbooks that I'm going to sell. Not in my Qur'an. Post it notes and flags are my best friends in the above types of books. I do enjoy reading annotations that the previous reader(s) left behind, especially when they consist of "the reader's thoughts about the text." Reading the reader's opinion made me laugh out loud. s/he felt very strongly about it and basically wrote a complete argument against it in the margins. But I would never. (Ok, I might, if I felt THAT strongly, LOL) I tend to feel like writing out my notes and just leaving them there in a book on the shelf makes me too vulnerable. I wont write personal reflections in a book - I save that for personal notebooks. I do write in some of my textbooks. Especially if it's a correction/important addition to the text. Occasionally I'll do brackets. I've sworn off highlighting, underlining, etc. in anything other than pencil/erasable marker though. I used to be an over-highlighter, and I find that it later distracts me from the text. I surprise myself by how OK I am with writing in books, LOL. I mostly work with homeschool texts, so I have a strict rule for my students to not write in any books. I photocopy workbooks! Previous posters' mentions of tearing apart textbooks and carrying them one chapter at a time made me cringe so hard! (But if I'm being honest with myself, I've done it to homeschool texts! And countless workbooks! Tear apart and proclick!) But most of my college textbooks either weren't useful enough in my classes to spend the time tearing them apart or were expensive enough that they were rentals or I was planning to resell them. When all nine circles of hell freeze over. The Half-Blood Prince wrote all over his potions book. 🙂 It was a major plot point for our hero, Harry Potter. If it’s not going to the next student in the homeschool and if I not going to try to sell it, then I have no problem with writing in books. I rarely have a need to with fiction, but I will mark up non-fiction if I need to use the information in there. Surely you have read Billy Collins Marginalia? I dog-ear. And I don’t care who knows it. Mark. In the book. It’s like a living relationship with the text. For my own studies I always mark up books. I have been totally unsuccessful in getting my kids to learn to mark up books, but then again, both of them are STEM types (where taking notes is probably the better way to interact with written materials--not that they do that either), so it probably doesn't really matter. I guess I really am the odd one out on this one. I won't even write in cook books. Nor do I have them out while I'm cooking. I either photocopy the page or hand write the recipe on scrap paper. I make my notes on that. I'm a heavy recipe tweaker so sometimes the recipe I start with barely resembles what I end up with. I keep my recipes on note cards until I'm done tweaking and then put them in my recipe book on my computer. I print out the recipes I need, when I need them but many I've just committed to memory, tweaks and all. I'm firmly on the side of absolutely no writing in books in case you couldn't tell. I don't like seeing others' notes either. I don't like to be influenced by others while I'm reading and forming my own opinions and relationship with what I'm reading. I take notes separately if I need to, always have since childhood. I also like to re-reading a clean text I've read before because often time and life experience can change my opinion and relationship with the text and I don't want to be influenced by even my own previous notes. It's more fun to me to go back and look at my separate notes after reading and see how my experience reading it has changed.